We are indian exporters of Rosy Pink Granite Tiles, Rosy Pink Granite Slabs. We, Eager Minerals Metals, are producer of rosy pink granite slabs, tiles, polished rosy pink granite floorings. The Indian rosy pink granite is mined from Rajasthan, India. our specialization in chamfered rosy pink granite kitchen tops tiles makes us a better choice as supplier of rosy pink granites for projects.If you have any query for rosy pink granite flooring, rosy pink granite slabs tiles blocks, rosy pink granite uses, just send us an inquiry for Rosy Pink Granite India. 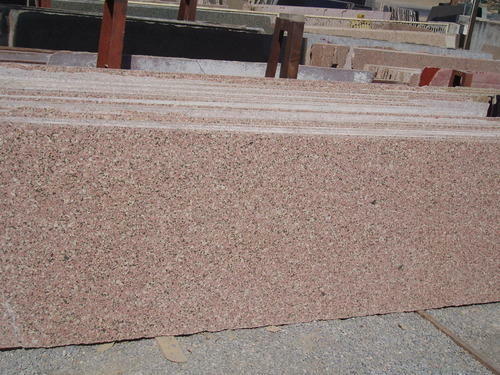 We determine Rosy Pink granite price, based on two factors; first - size and thickness of product and second - quantity required. Please send us enquiry, so that we can quote the best price of our rosy pink granite. Thickness of Tiles / Slabs ( In MM ) - 10,20,30 and other thickness can be supply on request. Establishment in the year 2014, we, Eager Minerals And Metals, are among the leading organization of the industry, actively involved in manufacturing, trading, supplying and exporting a quality assure assortment of Minerals,Natural Stones (Marble,Granite,Slate,Sandstone and Limestone),Semiprecious stones items,Gemstone (Slab,Tile and Customized items) and Handicrafts. In our wide range products, we are offering optimum quality Limestone Lumps, Quick Lime Powder, Hydrated Lump and Powder,Soapstone lumps and Powder,Green Marble,Black Galaxy Granite,Absolute Black Granite,Tan Brown Granite,Rosy Pink Granite,Red Granite,Dholpur Beige, Dholpur Pink, Dholpur Red,Rainbow,Teak,Buff,Raj Green,Kandla Grey,Kandla Brown,Jaislmer Yellow,Fossil Sandstone,Kota Brown,Kota Blue Limestone.We offer Copper,Silver Grey,Silver Shine,Zeera Green,Deoli Green,Kund Multi,Peacock,Forest Fire,Golden,Milky White,Tera Red in the slate and quartzite range of products.Also we are manufacturer exporter of Semiprecious stones / Gemstones slabs and tiles like Agate,Mother of pearl,Malachite,Carnelian,Amethyst,Tiger Eye,Lapis,Red Jasper,Rose Quartz,Aventurian etc. Offered collections of these products are formulated by taking high grade compounds as per the set industry norms and parameters and widely admired for their longer shelf life,Quality,Color,perfect formulation and size. To cater our client’s demands in an effective manner, we are offering Minerals,Marble,Granie,Slate,Quartzite,Limestone,Sandstone,Semiprecious stone items in Standard Export packaging.We are exporting our quality products in all over the Globe. Our organization is backed by top notch infrastructure unit, to process these Minerals, Natural stones and semiprecious stones slabs and tiles in compliance with laid norms by the industry. To formulate offered Minerals in a hassle free manner, we have parted our infrastructure unit into various performing departments. To handle these divisions, we have hired a team of skilled professionals. These team members are well versed with their domain fundamentals and concepts.Our entire process of manufacturing takes place under direct supervison of the highly skilled personnel thus assuring best quality at competitive prices.